As with the previous protests, Twitter was the most popular source of information for those interested with participants and supporters using the #2aprel hashtag to quickly spread information regarding any arrests or the direction the protest was going, especially as Fountain Square, where the protest was supposed to start at 2pm, was under police control from early on. Arrests started before the protest did, as reports about activists getting detained in their homes or on their way to the protest from tweeps such as @muntezir flooded in. Niyaz Nasirov, Musavat party member who was imprisoned for 8 days after 12 March protest, has been detained. Vugar Gurdganli, Dayanat Babayev and another activist have been detained in their homes in Khirdalan. A micro-bus taking 18 passengers from Sumgayit to the Baku protest has been stopped. It has been taken to Sumgayit 4th Police Department along with passengers. Simultaneously, pro-government activists carried out some ‘counter-protests’ of their own. 50-60 pro-government youths held a protest outside Ali Karimli's house. The police came later on, the protest ended without any intervention. Members of what many consider to be the ruling party's youth wing, the Ireli Public Union, also started using the #2aprel hashtag to counter anti-government statements as they had during previous protests. Suddenly there were more pro-government tweets than tweets about the protest. Given the content unrelated to the protests being held, some considered the pro-government tweets to amount to little more than spam and suggested blocking them. At the protest itself, however, as the riot police got involved things became more heated. Reports came in of tear gas being used, but photos and videos later showed that it was in fact mace. There were also reports of unknown individuals breaking windows in nearby shops. Police rounded up protesters into a bus. Then they threw tear gas in. Then got into the bus and started beating them again! In fact some felt, were it not for the police the protest would have just been “more of the same” from the opposition. As expected, nothing serious coming from the opposition. But if we take into consideration the uptight policemen, the government is seriously worried. 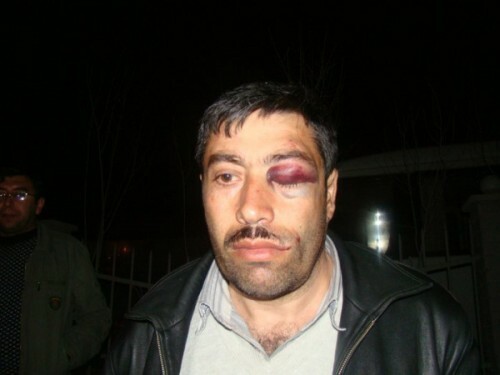 With pro-government activists believing that the police had done a good job, and that reports of injuries were simply opposition propaganda, Rauf Mardiyev of the Ireli Public Union posted the same line in a blog post. Peşəkarların dili ilə desək polis “təmiz” işlədi. Operativ və səliqəli. Bir nəfərin də olsun burnu qanamadı. Düzdür, müxalitət propaqandası nəticəsində ayağı “sınan” […] yüzlərlə insan olacaq, bəlkə də Xədicə artıq həmin siyahını qafiyəli formada səsləndirir ya da hansısa local “Al-Kaeda” öz veb səhifəsində yerləşdirib. Həqiqət isə Azərbaycan polisinin davranış və peşəkarlığının əvvəlki illərə nisbətən bir xeyli irəlilədiyini göstərir. As professionals would say, the police worked “cleanly.” Operative and neat. Not even a nosebleed in sight. Sure, as a result of opposition propaganda there will be hundreds of people whose […] legs were “broken”, maybe Khadija [Ismayilova, RFE/RL] is already saying this list in verse or some local “Al-Qaeda” has shared this on its webpage. 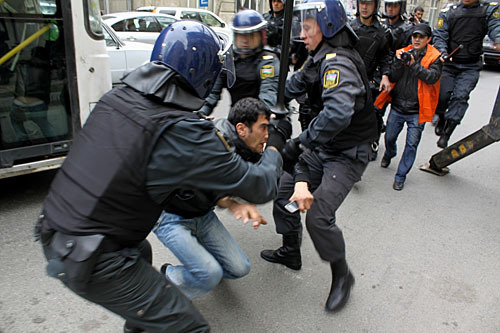 Reality is that Azerbaijan's police made some real progress in terms of conduct and professionalism. But, contrary to such claims, tweets about the fate of those detained started to emerge as the protest died down, some of which were graver than usual. There were also allegations of forcing opposition activists to admit to various crimes so as to detain or charge them. All in all, there were reports that anywhere between 115-200 people being detained out of a reported 600-1000 participants, although some of them have since been released.